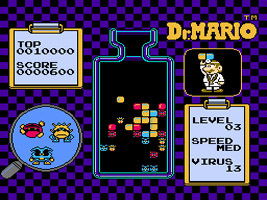 The Mushroom Kingdom has been hit by a virus, and it's up to Dr. Mario to wipe it out. You are presented with a jar containing three colored viruses. Mario throws two-colored pills into the jar and you have to move and rotate them so they form lines of four of the same color to make the line vanish. If the pills hit the neck of the jar then you have to start again. Clear the jar of viruses to advance to the next stage. As well as a stage-by-stage game with an increasing number of viruses, you can also play a 2-Player game against another player, where scoring combos will drop additional pill segments into your opponent's jar.